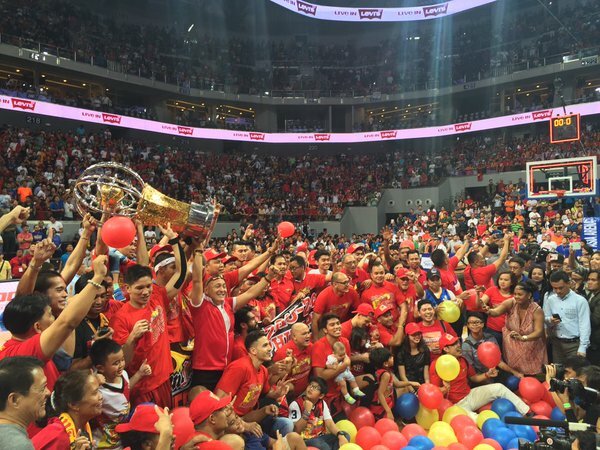 MANILA, Philippines - The San Miguel Beermen made a history after becoming the first PBA team to escape 3-0 deficit and won the championship, 96-89 over Alaska Aces in the Game 7 of the 2016 PBA Philippine Cup Finals held on Wednesday night at the Mall of Asia Arena in Pasay City. San Miguel also clinched their back-to-back Philippine Cup championships and their 22nd overall. SMB's guard Chris Ross was hailed Finals MVP finishing with a conference-high 21 points along with five rebounds and five assists. Ross averaged 8.4 points, 4.6 rebounds, four assists, 1.7 steals in the series. June Mar Fajardo, who missed the first four games of the series topped with 21 points and 15 rebounds. Marcio Lassiter had 15 points while Arwind Santos added a double-double with 13 points and 10 boards. Meanwhile, Chris Banchero led the Aces with 21 points while Calvin Abueva finished with 16 points and nine rebounds. San Miguel (96) – Fajardo 21, Ross 21, Lassiter 15, Santos 13, Cabagnot 8, Tubid 7, De Ocampo 7, Lutz 2, Espinas 2, Heruela 0. Alaska (89) – Banchero 21, Abueva 16, Baguio 10, Exciminiano 8, Casio 8, Hontiveros 6, Thoss 4, Baclao 4, Jazul 4, Dela Rosa 3, Manuel 3, Dela Cruz 2, Eman 0, Menk 0. Quarterscores: 22-16, 43-38, 68-51, 96-89.